…The Ride: The Book: Etc. The latest in the GameSpite Journal series has just body-checked the Blurb store with two available versions: Hardcover and paperback. As usual. Like The Anatomy of Castlevania Vol. I, this edition is the larger 10×8″ landscape format and isn’t available in black and white, so the price is a little higher than the platonic ideal for GameSpite books — though the one gracious move Blurb has made lately (they now price books per page rather than per 20-page folio) means that this issue comes in a few bucks cheaper than the Castlevania book since it’s slightly shorter. I’m still putting together a stripped-down, small-format, black-and-white edition for the budget-conscious, so please hold on if you’re interested in that particular book. I’ve also made the PDF version available (it’s attached to the hardcover book) if you’d like that in the short term — though please do remember that I’ll be setting up a separate PDF store sometime in the next few weeks. The cover looks better in the flesh than in this image — you can’t see it here, but Link’s Shadow has a sort of rough-edge look meant to call back to the Ganon Wraiths in Wind Waker, and the painterly effect on the coloring looks as nice as it did on the Castlevania book. The pink looks a lot more garish on-screen. Look, I was just being true to the material. Also, be sure to check out the inline previews on the bookstore to check out some of the great original art Philip “Loki” Armstrong provided for the book. Dude did a doodle for each and every write-up of both Zelda and Zelda II, because he’s insane. The back cover features Bill Mudron’s amazing Map of Hyrule, which you should buy at full size because it’s — what’s the word? Oh yes: Amazeballs. 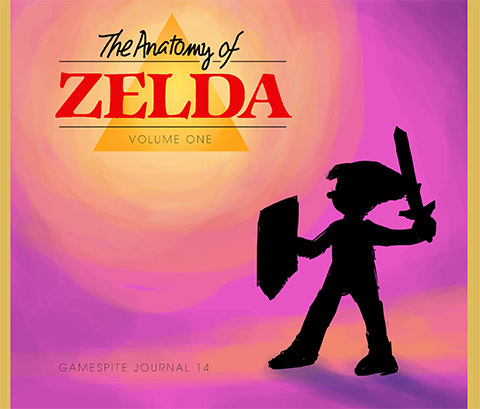 Also also, the thumbnail image for the hardcover book appears to have a graphical error (it’s missing the line separating “The Anatomy of” and “Zelda”) but the actual book will be fine. What you’re seeing is just a random visual artifact caused by their store system. And finally, the coupon code MAY15OFF should net you $15 off a purchase, though I’m not sure what the required spending threshold is for that. Poke around online for “blurb coupon code” and you’ll probably find something else that’ll work, too. Anything to offset their hideous shipping prices…. Alright, try the code CROWNED15 and see what happens. Edit: I’ve begun selling PDFs through Gumroad, per several people’s recommendations. The most recent two books are now up for $5 apiece, and I’ll be publishing back issues for a reduced price when I have time to get those up (i.e. after work). This entry was posted in Anatomy of a Game, Blog, GameSpite and tagged action rpg, anatomy of a game, GameSpite, nes, philip armstrong, zelda, zelda ii. Bookmark the permalink. Looks awesome! It’ll fit nicely on my coffee table with Hyrule Historia. “Sorry, this promotion cannot be be applied to books you did not author.” Boooo! Ah, it’s one of those? Lame. I’ll fish around for other promos. The outrageous shipping prices have stopped me from ordering these books all the way to Mexico. Hopefully a friend of mine can receive them in the US and bring them later. Yeah. Blurb’s shipping rates are surely destroying their business (and this one, as much as you can call it a business). Thanks Parish! In for both pdfs. The new code worked and I’ve got a copy on the way now, thanks!